Mustela putorius furo- The "Smelly Thief"
The domestic ferret, Mustela putorius furo, is most closely related to the black-footed ferret, M. nigripes, which is an endangered species native to North America (Pathology of the Domestic Ferret, 2012). It is also a close relative to the Spilogale putorius, or the Spotted Skunk. 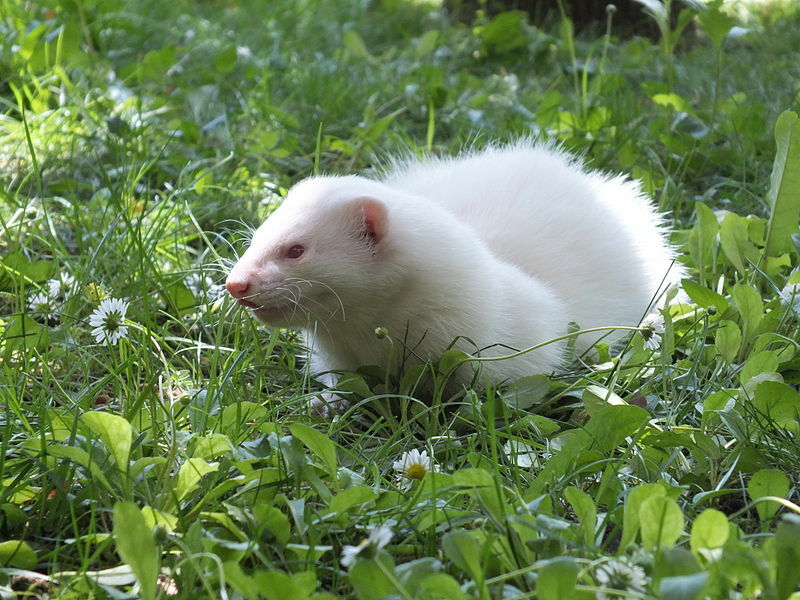 There are two common varieties among the domestic ferrets that are based off of fur color. The most common “fitch” ferret has a brown coat and a black mask-like face, feet and tail, while the “English” or albino ferret has a yellow-white coat and pink eyes (Pathology of the Domestic Ferret, 2012). Domestic ferrets are naturally crepuscular animals, meaning that they are usually most active during dusk and dawn. They sleep for about eighteen to twenty hours at a time, and are active for a few hours before going to sleep again. However, ferrets often change their active times to when their owners give them the most attention (Duda, 2003). Ferrets readily interact with other animals such as cats and dogs, and can be taught tricks and will respond to discipline. Also, they tend to urinate and defecate in the same spot, so they can be taught to use a litter box (Duda, 2003). Male ferrets, called hobs, are much larger than their female counterparts, called jills. Hobs usually weigh approximately three to six pounds, while jills usually weigh around one to three pounds (Pathology of the Domestic Ferret, 2012). Both, however, are much smaller than the Honey Badger, another mustelidae. Both sexes experience a fluctuation in their weights when a change in seasons occurs because subcutaneous fat accumulates in the fall and is lost in the spring. Fur also undergoes seasonal changes when ferrets molt in the early summer (Pathology of the Domestic Ferret, 2012). Domestic ferrets’ lifespans can range from six to ten years, most commonly six to eight, but eight to ten years is not unheard of (Duda, 2003). Some live for shorter amounts of time due to diseases and disorders such as rabies, parasites, flus, ringworm, and others (Pathology of the Domestic Ferret, 2012), but usually pet ferrets are given the proper vaccinations and care to prevent issues like these.